If you have several vehicles to detail, or a couple large ones, then the 12-gallon capacity heated Trusted Clean Auto-Detailing machine is right for you. Power out dirt and grime in the upholstery and carpeting in vehicles with ease. The external heater brings your water up to 170° F for effective cleaning. Don't need hot water for some jobs? Then take off the heater and leave it behind. This is one of the rare heated carpet extractors that operates on a single power cord. Even though this machine houses 12 gallons it's still easy to maneuver with it's large 10" wheels and easy-grip handle. Moving it in and out of a vehicle can usually be done with one person. The Trusted Clean Auto-Detailer comes complete with a stainless steel detailer tool, and a 15 foot vacuum and solution hose. 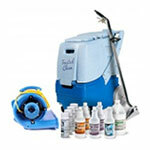 Just add your own carpet wand for residential or commercial carpet cleaning as well. Stainless steel heater tank and heating element promote long life and reliability. Sealed waterproof switches are inset at the top of the handle, ensuring safety and ease of operation. Dual wall solution tank cover keeps water hot. Single Vacuum motor delivers 136 inches of waterlift. Standard 5-gallon bucket fits under drain valve for easy emptying. Small, compact body weighing only 88 lbs. for exceptional portability. Lifetime warranty on tanks & heating element, 2 years on parts & labor, 6 months on the pump.